This bird was hovering just in front of me when I walked onto the common. She dived for something between two bushes, got to about four feet off the ground no more than fifteen feet in front of me and suddenly realised I was there. 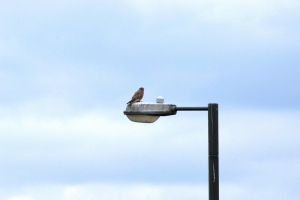 She instantly changed direction and flew up to the street lamp. Of course I didn’t get any pictures of any of this.